DJ Typoboy’s and Alan De Laniere’s remix is a 4 to the floor tech house track, driven by an uplifting piano melody and vocal groove. An absolute winner in the many electro swing clubs and speakeasies across the world. Typoboy is one the genre’s leading DJ’s and now making a name for himself with his own productions. Welcome to the striking yet sultry voice of Parisian singer and songwriter Dimie Cat: – with her unique blend of Jazz, Pop, Electro Swing & Vintage Beats, Dimie Cat is taking the dance floors of Europe, North America and Asia by storm with her stunning shows and nu retro pin up looks. This EP is a collection of remixes of her song ‘AAA (Triple A)’. The EP, contains 5 remixes by top producers and DJ’s with the remixes ranging from House, Tech – House, Underground House, Electro, Break Beat and UK Heavy Bass, there’s a lot of tasty dance tracks for electronic dance fans and ravers of varying different generic tastes. 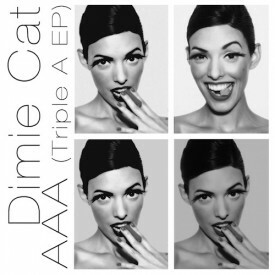 Remix spécial du magnifique AAA (Triple A) de Dimie Cat qui glisse tout seul, en mode roller coaster. Typoboy et son complice des îles lointaines (ADLN pour les intimes) on encore frappés.